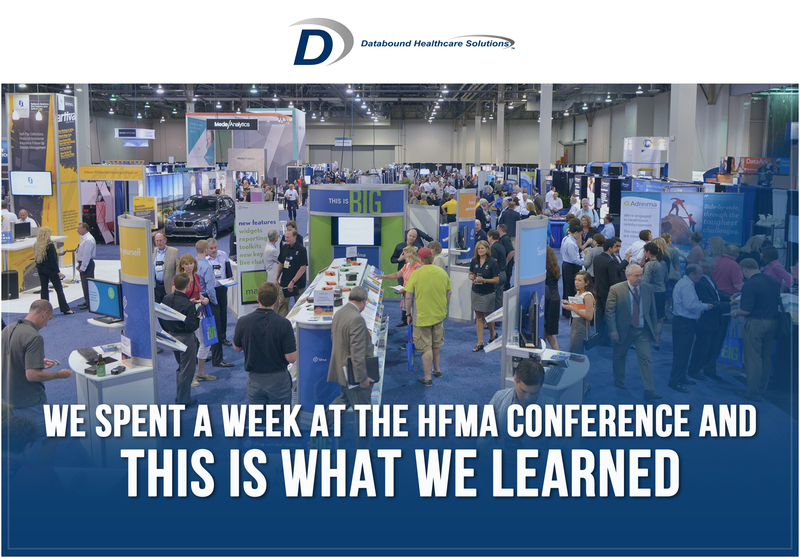 A few weeks ago, in the middle of a heat wave our team at Databound Healthcare Solutions boarded a plane and headed west to Las Vegas for the Healthcare Financial Management Association (HFMA) conference. We were fortunate enough to be surrounded by like minded thinkers, all with their own creative spin on tackling the problems faced by the healthcare industry. This being our first time at HFMA, we were in awe at the sheer number of companies, organizations, and individuals committed to solving a spectrum of healthcare problems. It was refreshing to hear from folks like Lisa Latts, Chris Moriates, and Derrick Walker, true experts in the field. From artificial intelligence and machine learning to the future of the revenue cycle, we learned so much and want to share it with you! As Deloitte Development pointed out in their Becker’s Hospital Review article earlier this year, RPA has a huge potential to improve hospital’s administrative efficiency, particularly when combined with other forms of business process outsourcing. This topic was all over HFMA, side-by-side with Artificial Intelligence, an evolution that we agree with and are watching with interest. We’ve been providing process automation top hospitals for years and have seen first hand the cost savings and potential revenue improvements it can achieve. During a panel presentation with a high profile cancer center, they noted that even though they have increased claim retention by over $15 million, they still have $23 million in claims subject to denials annually. We are fortunate to have the opportunity to help these hospitals, but there is still more work to be done. There is a huge opportunity to help hospitals manage and reduce denials and we’re proud to be among the industry problem solvers. There are many creative companies working to deal with the increased struggle of lost revenue. Hospitals that can cut through the noise with a sense of urgency on real solutions that will make a difference to their bottom line. We came back from HFMA reinvigorated by the value hospitals are achieving from a well thoughtful and practical automation strategy, stay tuned to our email blast for updates. This was our first time at HFMA and we can’t wait to come back again next year. Until then, we’ll be making use of everything we learned this year. If you missed us at HFMA and would like to get in touch, feel free to reach out! We’d love to hear from you.